Schmidt® portable abrasive blasting systems are the workhorses of the abrasive airblast industry. These blasters are designed to provide the industry's lowest pressure drop - less than 1.5 psi and in some cases less than 1 psi - compared to as much as 10-14 psi in other systems on the market. It is important to note that for every drop of 1 psi at the nozzle, there is a corresponding loss of 1.5% in productivity. When you choose a Schmidt pot, you're already starting out ahead. Clemco Industries offers a wide range of pressure vessels from .5 to 20 cu ft. in standard style machines. 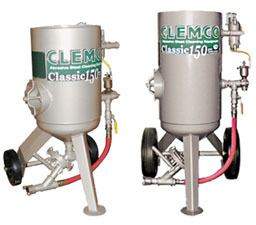 They also the manufacturer for the over-the-road "Big Clem" from 60 to 160 cu ft. 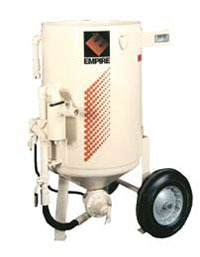 Empire Abrasive Equipment has the deepest portable line-up in the industry, and offers you the most rugged, dependable equipment on the market today. No matter what your budget, our portable blasters are built to keep you ahead of your competition and adding profit to your bottom line.